"Keep your head down. Don't get noticed. Or else. I'm Trella. I'm a scrub. A nobody. One of thousands who work the lower levels, keeping Inside clean for the Uppers. I've got one friend, do my job and try to avoid the Pop Cops. So what if I occasionally use the pipes to sneak around the Upper levels? Not like it's all that dangerous - the only neck at risk is my own. Until I accidentally start a rebellion and become the go-to girl to lead a revolution..."
Two Words: Literary Genius! I absolutely loved this book from start to end. It kept me interested, thrilled and engaged the whole time. I have to admit with the first two chapters I was slightly sceptical but soon I was hooked and everything started to make sense. I hadn’t actually read any of Snyder’s books before this one, but I heard a lot about the ‘poison study’ series, so when I read the blurb of this, it looked good and I was raring to read it and Snyder didn’t let me down. The book is about a time in the future where there is a system. Upper and lowers. Rich and Poor. There’s this girl called Trella, who knows the pipes of a spaceship and travels around in them. They have been kept inside this spaceship but some people want out. 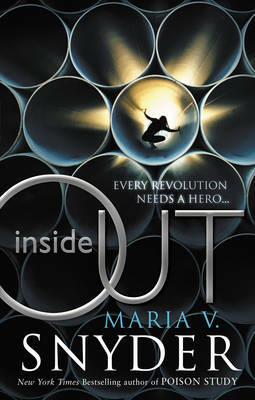 Basically someone convinces herself there is a way out and soon she finds herself head of a revolution against a certain brand of evil uppers. The book is full of action every chapter and full of unique ideas. I don’t think I’ve ever read a book were someone travels by pipes and I found this book very enjoyable in that way. I think Snyder has really explored a new type of future based on the concept of history repeating itself. I mean when I found out this whole book was based on a dream it blew me away because Snyder must have an amazing imagination! The plot is amazing and think Snyder kept it just the right size. I think if it had been any longer it would have dragged in which case I wouldn’t have liked it but it was a nice whole size that was well pace and well written. They way it was written was very good as well. The first person style was very different as in there was very little show of emotion, and thoughts. It was very blunt and to the point of what was happening. Surprisingly I like this and this was also good because it is a very complicated plot in general so it was complicated with thoughts and emotions. My favourite character would have to be Trella. She was just so upfront with everything and so strong but come on... eventually you have to break, right? No, not Trella. She can go through losing her friend, getting outside, hacking into a computers getting injured like a thousand times and still come out of it all shiny and new. She is strong. Of course there is a love interest, but I’m not giving names. It’s a very intense one and dark and surprising secrets are uncovered, lies are told and a victory is taken. Inside Out was amazing, now I guess its time for me to read Outside In, and I’m sure it won’t disappoint me. Five Stars.